Ted Burke:Most of our departures on Dylan's work, I think, was bout Dylan's post-John Wesley Harding album to the present day. I don't dismiss it entirely, but as a collection that accounts for his middle and late career, it is spotty at best. His is the problem of Having the compulsion to produce even when his muse isn't having lunch with him. But, yes, enough of exhuming of the glory days . As is, Dylan's work from that period is over examined and, I think, the tragic recipient of something that has cluttered and clouded appreciation of Shakespeare's plays, namely "Bardolotry", a near deification of the playwright. The writing that comes out of that is a slog. Writing about Dylan for most of the mainstream arts press, on line and print, has become a hagiographic exercise. The problem with the worshipful approach is that it obscures the real instances of brilliance in the work. Barry Alfonso:I think some of that hagiography comes out of a fascination with Dylan as the embodiment of arrogant visionary youth circa 1965-67. His work after this period seems to exert less fascination. It also speaks to the lack of a commanding voice in popular music over the past 50 years. There's some combing and re-combing through the Costello catalog these days, but still there is no stopping the endless parsing of Dylan's prime era. His burst of brilliance speaks to the lack of similar bardic vision today. Ted Burke:Umberto Eco, the novelist, has written that there are limits to how texts, in this case songs, can be interpreted and made to seem to have yield previously undisclosed meanings and nuance. He insists that there really does come a point where interpretations only repeat themselves if we wish to stay with what is actually in the material; beyond that,it is a matter of academics and pop music critics trying to stay in business. Dylan, not to diminish the greatness of his best work, has been over discussed , inspected, and extrapolated upon where the actual man who wrote the songs no longer exists and the songs becomes mere props to brace up the flimsy theorizing that dims the worth of the music. I am not sure if I would say that there haven't been other songwriters in Dylan's time or in more recent years who haven't had visions, bardic and otherwise, comparable to Dylan's; Van Morrison, Costello, Tom Waits, Neil Young, Joni Mitchell, off the top of my head, have written and recorded work over the decades that has moments of major greatness that is , I think , no less than Dyan's . Dylan is the case of being the first one out of the gate, the mood of the times and the songwriter's desire to excel as no else had creating a synergy that changed the way the rent gets paid. I almost think it was merely a happy accident that it was Dylan who became the poet, the spokesman, the prophet, all that rot; if it hadn't been Dylan, another musician would have filled the need.Or maybe not. Phil Ochs, who I think is Dylan's equal as a "rock poet" , certainly had the talent but not, from what I've read about him, the temperament to get to the top and remain there. Dylan understood the complications of persona. 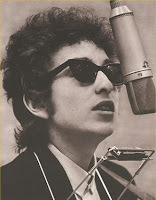 In any event, it maybe a case of that if Dylan had not existed, the times would have created him, or someone like him. Contrarily, there is the Great Man Theory of history that puts forth that events of historical consequence are the result of the impact "Great Men" have on the destinies of the countries they rule . In this instance, if Dylan hadn't been born, we might still be wearing side burns and be listening to Como and Clooney through cheap car radio speakers. Barry Alfonso:Yes and yes. Dylan did a lot of things first. And he changed. He rebelled against the rebels. Phil Ochs was an eloquent advocate and a poignant chronicler of his own disintegration. But he lacked that cruel streak, that arrogance that people seem to gravitate towards. The Great Man theory in history is pernicious and leads to the sort of blood and thunder hero-worship Carlyle and Wagner engaged in. But there is some truth to it and, yes, Dylan may have saved us from unchallenged Comoism.